The Dimplex Opti-Myst Electric Fireplace Cassette Insert is a great way to express your own unique style and flare for design. With multiple installation possibilities, the cassette can be integrated into a custom mantel, built into a wall, installed into a cut-out, there are virtually an endless number of installation possibilities. You can even put several units together to create a larger, more dramatic fireplace experience. You’ll be mesmerized by the unmatched realism created by the Dimplex patented Opti-Myst flame technology. 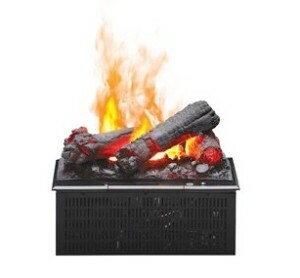 Ultrasonic technology is used to create the flame and smoke effect which rises as mist through the life-like log set. The unique lighting pattern reflects off the water vapor creating an authentic flame and smoke effect. The Opti-Myst cassette stays cool and requires no special venting so it can be installed virtually anywhere in any way. The hidden water reservoir offers up to 14 hours of continuous flame effect before needing refilled. 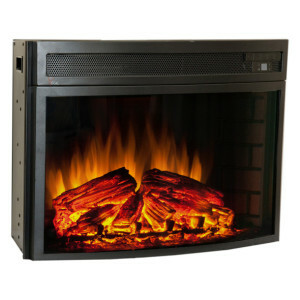 Easily control the electric fireplace from virtually anywhere in your room using the included remote control. The Opti-Myst electric fireplace cassette provides, what many believe to be, the most realistic fake fire experience currently on the market. You will fall in love with the stunning flame effects no matter how or where you choose to use your insert.